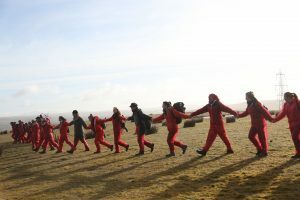 Ffos-y-fran, south Wales – Several hundred people have halted operations at the UK’s largest opencast coal mine, using their bodies to form a massive red line across the mine. 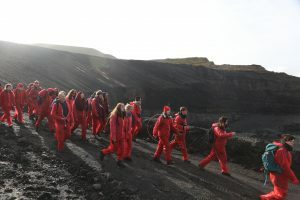 The mass civil trespass by climate action network Reclaim the Power began at 5.30am this morning and is the largest ever action in a UK opencast mine. The activists, who have travelled from across Britain and beyond, continue to peacefully occupy the site. Mining work has now been halted. 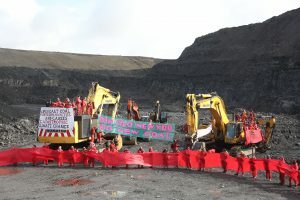 Giant inflatable “cobblestones”, red boiler suits and umbrellas are among the creative tools being used to stop mining operations. Nine people, including an 80 year old from Penarth and members of Christian Climate Action, are locked to each other, blocking road access to the mine. “Today we’ve shut down the UK’s largest coal mine because we must keep fossil fuels in the ground to stop catastrophic climate change. “Continuing to dig up coal is a red line for the climate that we won’t allow governments and corporations to cross. “We are taking action in solidarity with the local community who have been battling Ffos-y-fran for nearly a decade, and now face the threat of a new mine next door. “Wales deserves a transition away from dirty coal, and the creation of sustainable employment in an economy that respects our planet and its inhabitants, now and in the future. The action supports a long-standing local campaign by the United Valleys Action Group, who are now resisting a proposed mine at Nant Llesg. Caerphilly County Council rejected the application in August 2015 but the company Miller Argent is seeking to overturn this democratic decision. Coal is facing a downturn globally. The Aberthaw power station that uses 95% of the coal mined at Ffos-y-fran proscar no prescription forum announced last week that it is scaling back operations. Reclaim the Power have spent the last four days at an ‘End Coal Now’ camp on common land near Ffos-y-fran. Since Saturday, they have organised events with residents, unions, councillors and Assembly candidates to highlight the potential for thousands of sustainable jobs in clean energy industries, rather than the opencast mining that has devastated the local area. The UK government announced an intention to phase out coal power by 2025 last autumn, but has not acted on this promise. The Welsh Assembly voted in 2015 for a moratorium on new opencast coal mines, but this has also not been turned into law by the current Welsh government.